Enjoy a second beachside audience with the simian king who goes by the unlikely name of Gary in Gorilla Go Wilder. 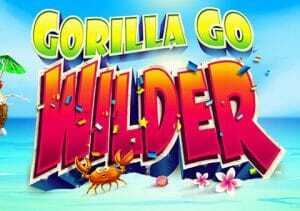 This sequel to NextGen Gaming’s Gorilla Go Wild video slot is a similarly madcap affair. Played using a 5 reel, 25 payline game engine, it comes with streak re-spins and 8 different free spin rounds with added extras. The more times you trigger the feature, the more free spin options will unlock. Play on your PC, tablet or mobile device from between 30p and £75 per spin. King Gary’s first outing was a colourful one and this follow up is another bright and jaunty affair. The reels are set against a tropical beachside backdrop. There you’ll find A to 9 royal values plus a selection of Gary’s animal subjects include raccoons, birds and baby monkeys. The top standard symbol is the gold coin (featuring Gary’s face) which pays 33.33 times your bet if you land 5 across a payline. His majesty himself is the wild. Gary substitutes for all the standard symbols as well as delivering payouts of 50 times your bet if you hit 5 on a payline. Following any winning spin, you could trigger the Shell Re-Spin feature. These re-spins keep on coming as long as a new shell symbols lands. The value of the shells can vary. The more times you’ve triggered the feature, the bigger the potential rewards. Gorilla Go Wilder also comes with a selection of free spin rounds via the Bonus Islands feature. Landing 3 or more scatters on the same spin delivers a payout 4.16, 8.33 or 83.33 times your bet – you’ll also trigger 1 of 8 free spin rounds. Mystery Crystal Bonus feature – mystery symbols are in play here. They all mutate into the same matching symbol whenever they land and a payout is made. Power Paytable Bonus feature – these free spins use a new paytable which awards up to 50 times your bet for each symbol when you land 5 on a payline. Expanding Wild Bonus feature – land a wild during this feature and it expands to fill the whole of the reel. Mega Stacks Bonus feature – symbols spin in full stacks if you opt for this feature. Lava Lines Bonus feature – the number of paylines in play expands here. Instead of 25 paylines, the reels will offer 50, 75, 100, 125, 150, 175 or 200 paylines. Hidden Wilds Bonus feature – on each free spin, a symbol will transform from a standard one into a wild. Wandering Wilds Bonus feature – a pair of wilds roam across the reels throughout this round. If the 2 wandering wilds end up on the same square and go on to form part of a winner, then the payout gets boosted by a 10x multiplier. Multiplier Zone Bonus feature – look out for the special multiplier zone that’s added to the reels here. Land a winning combination in the zone and you could see your payout boosted by between 5 and 25x. Was the world waiting for another outing from King Gary? Probably not. It’s no bad thing that this sequel has appeared though as it delivers some pretty funky extras. Unlocking them can be a bit frustrating but there are some decent potential rewards on offer when you do – up to 37,500 times your total bet on every free spin in the Multiplier Zone Bonus feature with the potential 25x multiplier . The streak re-spins aren’t bad either. This is a supremely silly video slot but it’s enjoyable enough. If you enjoy the rather slapstick theme, there’s good action on offer in this audience with King Gary in Gorilla Go Wilder. If like gorillas and monkeys, Playtech’s Epic Ape is recommended.